Trenching work being carried out at Il-Lunzjata, limits of Rabat, yesterday. Roadworks by State agency Infrastructure Malta at Il-Lunzjata, in the limits of Rabat, have resumed just days after the Environment and Resources Authority issued a stop and compliance order. The environment watchdog intervened in the wake of complaints that a project to resurface some country roads was being carried out in breach of environmental regulations. Though the agency is refuting the claims, this was the second such incident in a few days. In the first instance, work in the area of Wied l-Isqof, also in the limits of Rabat, fuelled outrage amid concerns that country lanes were being transformed into fully-fledge arterial roads. Subsequently, the ERA issued a stop notice saying the work was causing environmental destruction. In the case of Il-Lunzjata, the alarm bells were sounded last Sunday by biodiversity expert Alfred Baldacchino. In an e-mail to the ERA, he expressed his concern that such works would result in further destruction of biodiversity. He insisted that he was not against improving access to farmers as long as this would not encroach on adjacent virgin land, outside the road’s footprint. Replying to questions from the Times of Malta, an ERA spokeswoman on Monday said that a stop and compliance order had been issued. However, following an on-site visit, it transpired that work at Il-Lunzjata had resumed. Though the Times of Malta alerted the ERA about the matter, it could not be established if work had resumed with the authority’s consent or not. An Infrastructure Malta spokesman denied that roads were being widened. While making no reference whatsoever to the stop and compliance order issued by the ERA, he noted that the latter were being consulted on any additional protective measures or interventions that may be necessary. “It has also taken note of the environmental concerns being raised about these road improvement works. “The agency is following the guidance of the authorities to ensure that while the required improvements for farmers are implemented without further delays, the surrounding rural environment is duly safeguarded,” the spokesman said. 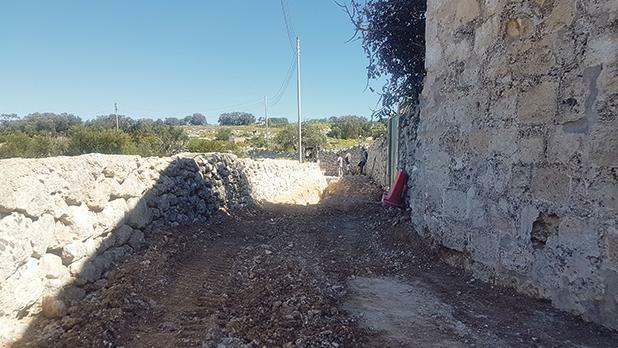 Infrastructure Malta pointed out that the project was part of a wider plan to reconstruct over 40 kilometres of rural roads. The spokesman said that concrete, asphalt and other materials were being replaced with stronger foundations and new surface layers. As for the criticism that all vegetation at the side of the road was being destroyed and covered in concrete, the agency said, that this was necessary to strengthen the foundations. It added that reinforced concrete was being used to prevent certain roads from caving in.